Joe Canning, Cian Lynch and Padraic Mannion have been recognised for their performances this season. Canning, Lynch and Mannion are all nominated. GALWAY’S JOE CANNING is in the hunt to retain his Hurler of the Year award after being nominated for the 2018 accolade along with team-mate Padraic Mannion and Limerick’s Cian Lynch. Canning would become the first player to win the honour for two successive years if he is voted the victor. It is his third time being nominated after also being recognised in 2012 and 2017. Mannion and Lynch are both first-time nominees with Lynch aiming to become the first Limerick player to claim the honour which is part of the 2018 GAA-GPA PWC All-Star awards. Portumna attacker Canning scored 2-78 during the 2018 championship, Ahascragh-Fohenagh club man Mannion was again central to Galway’s progress and Patrickswell’s Lynch sparkled in midfield for Limerick. Who do you think was the best hurler this season? Email “Galway pair and Limerick midfielder nominated in battle for 2018 Hurler of the Year”. 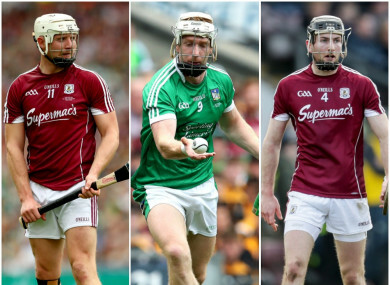 Feedback on “Galway pair and Limerick midfielder nominated in battle for 2018 Hurler of the Year”.